Save the Great Lakes, Save Ourselves! The Great Lakes provide 20% of the world’s drinking water. They are at great risk. As we write this statement there have been several incidents that are precursors to the potential destruction of the Great Lakes. In August, there was an explosion at the British Petroleum refinery in Whiting, IN on Lake Michigan. We are assured by the company that everything is fine, but this comes after an oil spill in March, 2014. To this date, we have not been informed as to whether it was tar sands that was spilled into Lake Michigan. BP in Whiting is one of the largest refineries for tar sands in the U.S. In July there was an outbreak of phosphorous induced toxic blue algae in Lake Erie near Toledo, Ohio which caused drinking water in the area to be contaminated. It is estimated that over 400,000 residents were affected. Enbridge Corporation is trying to transport tar sands by shipping it through Lake Superior and all the Upper Great Lakes. “Wisconsin regulators tabled an earlier permit application for a tar sands crude oil maritime loading dock in Superior after residents objected.” Eric Hanson, Midwest Energy News 4/15/2014. The Great Lakes do not stand alone. Rivers flow into the lakes. The Calumet River in Illinois flows into Lake Michigan. Pet coke (Petroleum waste) has been stored along the Calumet River and has been polluting it. In July, 2010, an Enbridge pipeline break poured 840,000 gallons of tar sands crude oil into Michigan’s Kalamazoo River. To date, the cleanup is not complete with over a billion dollars being spent. “Our mistreatment of the natural world diminishes our own dignity and sacredness, not only because we are destroying resources that future generations of humans need, but because we are engaging in actions that contradict what it means to be human. Our tradition calls us to protect the life and dignity of the human person, and it is increasingly clear that this task cannot be separated from the care and defense of all of creation.” – US Catholic Bishops, Renewing the Earth, 1991, p. 2. According to the Alliance for the Great Lakes, the U.S. and Canada should enact regulations or pass laws to meet the phosphorous targets from the Great Lakes Water Quality Agreement. Currently the Agreement does not require the U.S. or Canada to do that. S. Army Corps of Engineers must stop using Nationwide Permit 12 (a process expediting approval for projects like access roads and pipelines that do not result in the loss of greater than ½ acre of waters of the United States for each single and complete project) for long pipelines like Flanagan South in Illinois and Keystone South. Instead these pipeline projects should be transparent, open to public opinion, and be reviewed for compliance with the Clean Water Act. The “Halliburton Loophole” that allows a fracking exemption to the Safe Drinking Act must be overturned. Fracking also pollutes potable water. Tar Sands and Fracking should be discontinued as ways to provide energy into the future. Renewable energy sources should be invested in and used. Microbeads should be removed from all personal care products. Water is a requirement for life. Access to water is a right rather than a privilege. When we look at the future of the Great Lakes, we are gazing into our own future. Now is the time to act to preserve the Great Lakes and indeed our own futures. 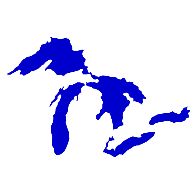 Religious Coalition of the Great Lakes is a group of sisters and lay women, each of whom lives on the Great Lakes. The Grey Nuns of the Sacred Heart are one of the participating Religious Congregations.